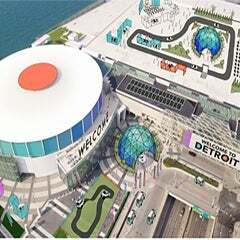 DETROIT – Operating expenses that were more than $1 million below budget and parking revenue that was much higher than expected helped Cobo Center finish its 2013 fiscal year with a profit instead of a $1.5 million loss, the Detroit Regional Convention Facility Authority reported. The DRCFA had net operating income of $287,426 in the 2012-13 fiscal year that ended Sept. 30. 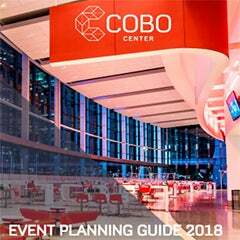 The Cobo Authority’s original budget forecast a loss of $1.5 million because fewer big shows were booked than the previous year, and there would be no revenue from Cobo Arena as it was being transformed into a new ballroom and atrium. “We are thrilled that we turned a small profit in a year that we knew would be a difficult transition period for us,” said Patrick Bero, CEO/CFO of the Cobo Authority. “Now it gets fun, with the Grand Riverview Ballroom and Atrium open and bookings up, we’ll see big improvements for the next two years.” Bero said the profit was remarkable because operations were complicated by the extent of the work completed on the $279 million capital improvement project. Expenses for Cobo Center operations, parking management, and DRCFA administration were a combined $1.1 million lower than what was budgeted for the year. The DRCFA spent $14.5 million rather than $15.6 million on those items. Parking revenue for Cobo Center finished the year at $3.5 million, more than $617,000 higher than expected. Three factors behind that performance were increased revenue during the North American International Auto Show, increased monthly parking contracts and the resumption of the National Hockey League season when its labor dispute ended. The DRCFA anticipated no parking revenue from Detroit Red Wings games at Joe Louis Arena next door, but the 24 regular-season and six playoff games that were played significantly bolstered revenue. The 40,000-square-foot Grand Riverview Ballroom, 30,000-square-foot Atrium, and 21,000 square feet of new meeting space officially opened in September and have seen a steady stream of business since then. They will be heavily used during the 2014 NAIAS that opens with Press Days on Jan. 13 and closes to the public on Jan. 26. 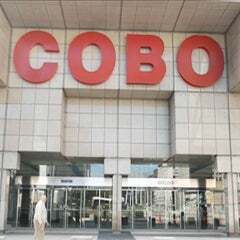 Cobo Center is expected to generate nearly 20 percent more operating cash over the next two years while absorbing another $2 million reduction in the subsidy it receives from state taxpayers, according to budgets approved in September by the Detroit Regional Convention Facility Authority. The five-member DRCFA adopted a $15.8 million operating expense budget for its 2013-14 fiscal year, and $16.1 million for 2014-15. Strong year-over-year revenue gains are anticipated in both parking and Cobo Center operating revenues as more elements of the facility’s $279 million capital improvement program come on line and additional conventions, trade shows and meetings are booked in the renovated space. The capital improvement program that includes the ballroom, atrium and major upgrades throughout Cobo Center was 69.2 percent complete through September. Construction is on track for completion at the end of 2014, with nearly $193 million spent by Sept. 30. A new kitchen and food court are nearing completion. Major construction work moved to the south side of the building along the Detroit River following the completion of the ballroom and atrium. Two of the four levels on the south side will be complete by the time the NAIAS begins next month.